We all love watching a good game, and there’s nothing better than getting outside to enjoy a breath of fresh air while we watch our favorite team. The summer months are an especially great time for sports fans, offering the opportunity to get outdoors every time we head out to see a game. But there’s nothing worse than being blinded by the sun or having to worry about sunburn when all you want to do is chill out. Thankfully, JoeShade sun shade umbrella makes it easy to stay comfortable in the shade no matter how harsh the sun gets. JoeShade is the perfect fit for any sports fan. Baseball, soccer, lacrosse, and football – whether you’re a fan following your favorite team or a parent taking your kids to practice, JoeShade makes watching your team a relaxing getaway in the shade. JoeShade’s wide umbrella brim and easy to adjust stand make it an easy setup anywhere, while its sturdy tripod base and stakes means it can stand up to strong winds on uneven ground with ease. At JoeShade, we’re sports fans at heart – in fact, JoeShade was first invented as a solution to keep comfortable on the sidelines watching youth sports. Back in 2002, we watched parents and grandparents tire themselves out as they passed flimsy beach umbrellas back and forth in an attempt to stay cool and protected. Great plays and amazing saves were missed. Their attempts to stay shaded meant they’d miss their kids stepping up to the plate. We realized we needed a solution that was easy to use, portable and lightweight. 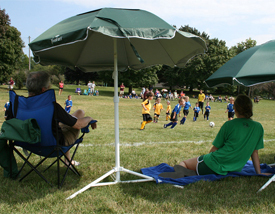 We originally invented JoeShade sun shade umbrella with sports fans in mind. We made sure that no matter the game or the ground it takes place on, you’ll be able to set it up quickly and easily so that you can get back to relaxing in the shade. We also ensured it provided an extensive amount of stability. Finally, we designed it to be incredibly lightweight and portable so that you can take it just about anywhere. 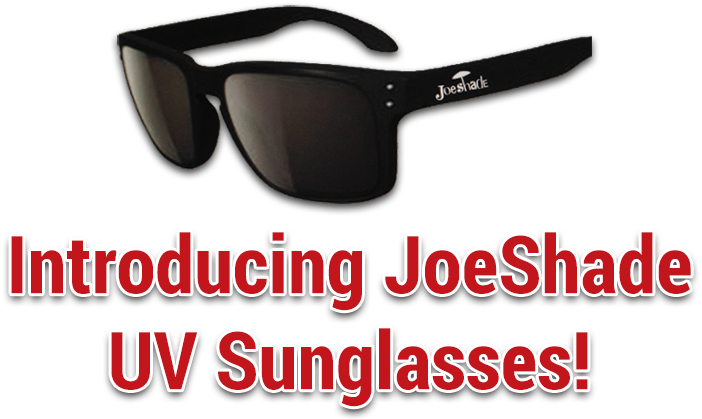 We developed JoeShade so you could take your mind off the hassle of the sun and stay focused on what matters to you. Take your shade wherever you go – bring a JoeShade portable umbrella.